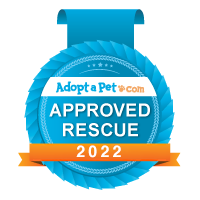 Broken Tail Rescue is looking for responsible and caring people to give a dog or cat their much-needed second chance at happiness. To adopt from us, you must first complete an application. You may complete it online right on our website. Once your application is received, a volunteer will email you within 48 hours. Please be sure to check your spam folder if you have not received a response within that time frame. If the pet is a good match for your family, you will then be asked to meet the pet at the foster parent’s home (or visit the cat at the Cambridge PetSmart adoption center if it is located there). We ask that all members of the household come out to meet the pet. If you are applying for a dog, all current dogs in the household need to come meet the dog as well. If the animal is a good fit for your home, we will then check your references. We ask for two personal references and the name of the vet that you currently use or have used in the past. The last step in the adoption process is the home visit (for canines only). We just want to make sure your home is generally a safe place for the pet to live and confirm the address listed on the application. After the home visit, the adoption can be completed! Paperwork is completed at the foster home, and you can take home your new pet! While the process may seem extensive, it generally is not a long, drawn-out process – we can move as quickly as schedules allow, and most adoptions are completed in under a week. However, we feel it is important to take time to make sure we are matching the pet to the correct home. We would hate for a pet to be returned to us because of a hasty decision. Adoption fees help defray the cost of transportation, care, and medical treatment. Our adoption fees are generally between $300 and $400 for most adult dogs and puppies and are decided on a case-by-case basis. All dogs adopted from Broken Tail Rescue will be spayed or neutered, receive a veterinary exam, be up to date on vaccinations, heartworm tested and started on preventive, dewormed, given flea and tick treatment if needed, and microchipped. All cats adopted from Broken Tail Rescue will be spayed or neutered, receive a veterinary exam, be up to date on vaccinations, FeLV/FIV tested, dewormed, given flea and tick treatment if needed, and microchipped.